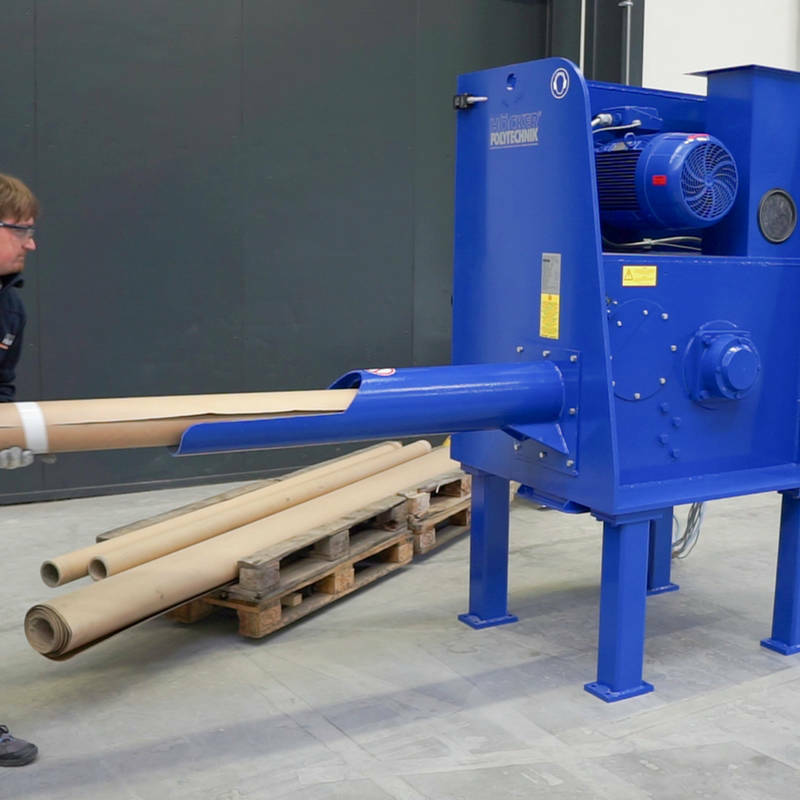 Why Choose a Core Shredder Unit from Hocker North America? The Core Shredder: Problem Solved. The volume of paper that larger box plants use is immense. Every day ton of heavy paper reels are processed. With each processed reel remains a core that has to be recycled. This can present board plans with a real headache and added expense. Such cores are a special challenge for the downstream recycling process. Without any particular pre-treatment, they can damage traditional conveyor belts and balers. This damage can mean a plant’s own waste treatment plant is down for days, resulting in heavy repair and lost time costs. Because of this risk to machinery, cores are often separated out and often disposed of at a fee. Hocker North America offers a new and improved solution. Instead of risking machinery and efficient, or paying additional fees for outsourced recycling options, Hocker has declared war on cores. impressive core shredding unit weighs more than two tons, featuring sturdy construction and user friendly operation. The Core Shredder has a frequency regulated, 22kW motor that drives the cutting mechanism. The cutters are produced from long-lasting, top quality, specially handed steel. A smart feeder controller regulates the feed so that shredding is guaranteed under any circumstance. The destructive power of the core shredder is particularly impressive. It shreds up to 120 cores (length: 3m) per hour and is easy to operate. The cores, which can be up to 160 mm thick with wall thickness up to 40mm, are simply pushed into the intake and automatic feed pulls them into the cutting device. The Core Shredder Unit can be set up to operate in less than a minute. It can be operated continuously, but it doesn’t need to be. Simply flip the switch, start the motor, and feed the cores. The shredded pieces can be easily recycled afterwards. This Shredder Pays for Itself. Every shredded core saves you money. At approximately 1,500 tubes per month, the Core Shredder pays for itself in less than two years! Enthusiastic PPH users confirm this calculation after several months of actual use.